Many believe in choices and in markets. But markets work effectively only when there’s a reasonable relationship between cost and price. The current $1.6 Billion plan for the Durham-Orange Light Rail Train assumes 50% Federal funding, 25% state and 25% local. The 25% local funding is comprised of a 0.5% sales tax, $10 annual vehicle registration fee and 5% tax surcharge on car rentals. However, the NC General Assembly capped the state’s potential contribution not to exceed 10%. As of DEIS filing in 2015, that means $670 million in local taxes, just to build this (before adding an additional 40% of likely cost overruns typical of major public transportation projects). 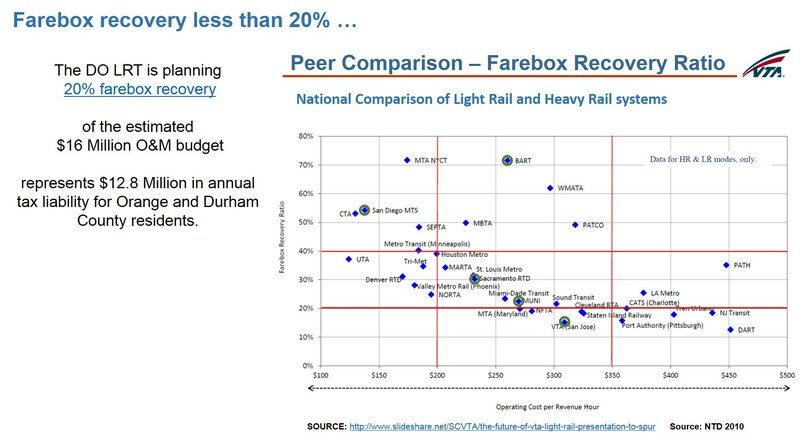 Reviews of 30 Light Rail projects around the nation have conclusively demonstrated that all of them operate at a loss requiring average tax payer subsidies of 70%. The revenue associated with fares does not offset the annual operating and maintenance costs.